About a month before the walk, I decided to draw up a list of items that would be needed for the walk, then, having collected it all together, tried to get it into the rucksack. 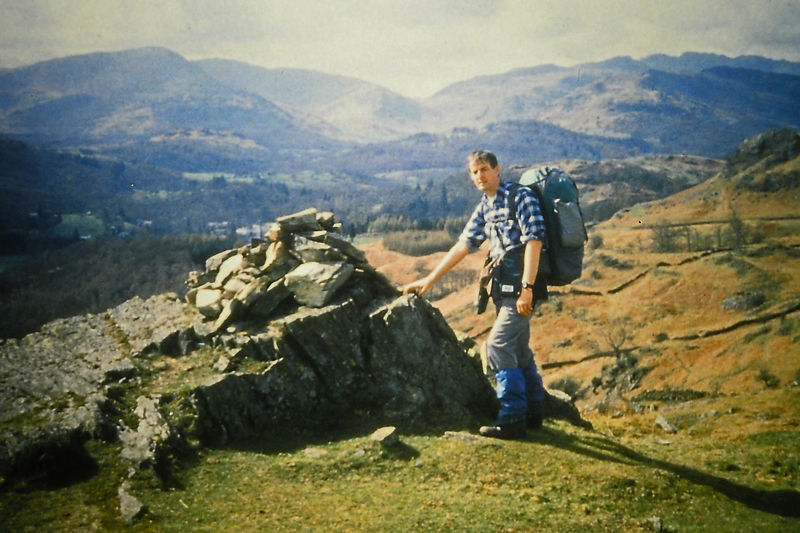 Have you ever tried to get your wardrobe into a rucksack? 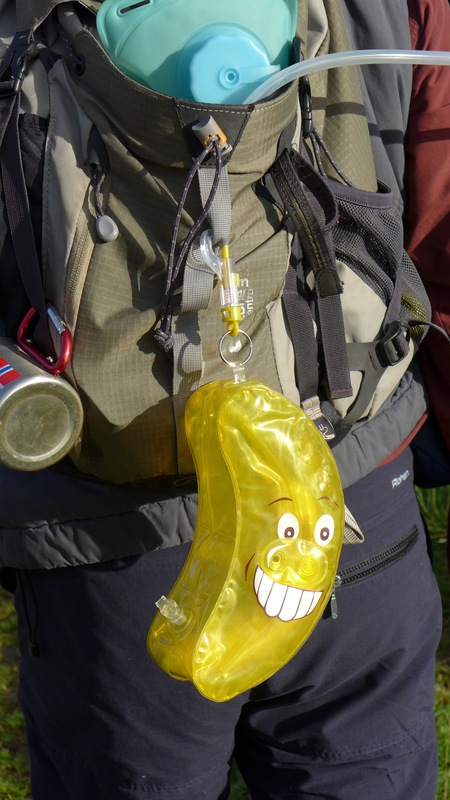 One rucksack with essential banana protector (present from a ‘thoughtful’ friend!). The blue plastic thing with the tube is a platypus drinks container essential to allow drinking on the move. It proved impossible but, after throwing out a lot of clothes and wondering whether I would be walking half-naked, I eventually succeeded. I tried to lift the rucksack to find that I could hardly get it off the ground. Have you ever tried to lift a bag of potatoes? It felt the same. Panic set in and I quickly threw out a further two pairs of underpants. This still left three which, with a bit of ‘crop rotation’ washing en route should suffice; each day wear one pair, dry another and wash another. Four pairs of ordinary socks were then removed leaving one pair for the evenings; this should be sufficient as most of the time I would be wearing walking socks. The toothpaste and shaving foam seemed heavy and so next day I went to the Body Shop to buy some much smaller travel toothpaste, a tiny toothbrush and a small tube of shaving cream. A visit to the local outdoor shop led to the purchase of concentrated soap and field towels. The latter are like silk, dry very quick and, unlike ordinary towels, are not bulky. The disadvantage is that they go cold when wet and, after a shower, it’s like putting ice on your back. My wife had treated me to a very expensive, lightweight, windproof replacement for my heavy pullovers. I have never understood the logic of women. On occasions they can make you feel guilty for going away for a day’s walking but in the next breath they treat you to some expensive equipment which, presumably, is to encourage me to go away. I have given up trying to understand the inconsistencies, but just accept them in the same way as I accept varying weather. Maybe, instead of weather forecasts, we should have women forecasts? Still, for some reason, she was generally supportive of my forthcoming escape from domesticity. If you want to be a serious walker, either remain single or, if you do get married, make sure your wife is not obsessive about ‘do it yourself’ jobs around the house; otherwise you will be chained to decorating the house every weekend and holiday. She must also like her own company from time to time so that she is pleased to see you disappear for a few days.